If you like either the NSAWC or AFFTC aircraft, love to add resin and PE then this is great value for your modelling dollar. An ACMI pod would have been nice. 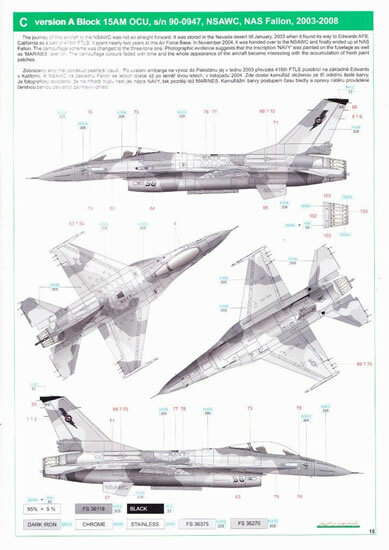 The United States Navy, Naval Strike and Air Warfare Centre (NSAWC) operates ex-embargoed F-16s that were to go to Pakistan in the 1990’s, these aircraft initially ended up being stored in the desert at AMARC. After the demise of the (T) F-16N aggressor force, the US Navy lacked a high-performance aggressor aircraft. 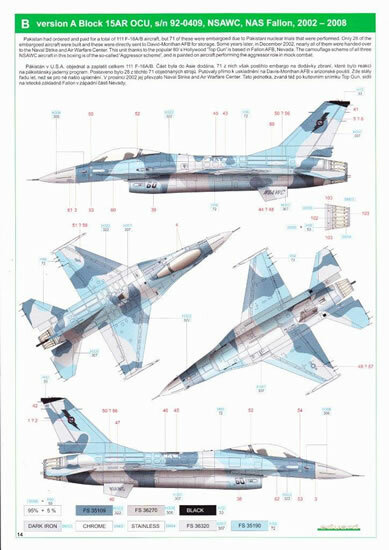 Because of the low airframe life of the embargoed Pakistani F-16s, these airframes were ideally suited for the demanding aggressor role. Half of the embargoed F-16s went to the USAF and the other half went to the USN. In total, 14 F-16s were delivered to NAS Fallon. The NSAWC while much more than an aggressor squadron, sees the F-16s used strictly as aggressors. Essentially NSAWC became the new 'Top Gun' and came about due to the 1993 Base Realignment and Closure, which recommended moving 'Top Gun' and consolidating it at NAS Fallon, Nevada. Therefore 'Top Gun' still exists as a school but not as its own individual squadron. 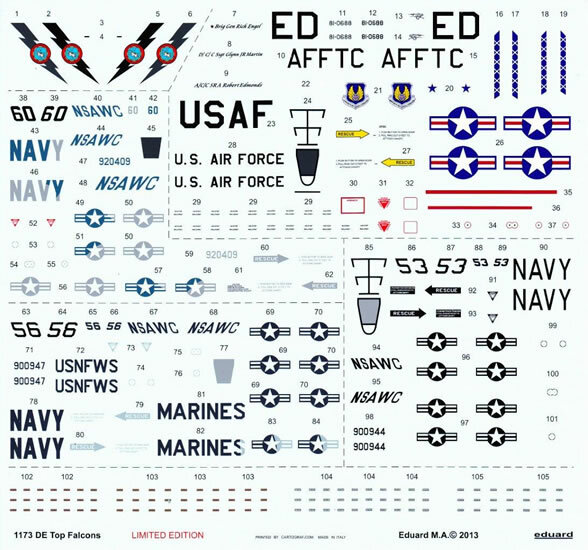 This is the same donor kit that I have previously review here, the main difference is the decal sheet, so I will concentrate on the markings provided in this kit. The construction is almost identical to the NATO Falcon with the exception of the smaller housing at the base of the fin and lack of later IFF upgrades. 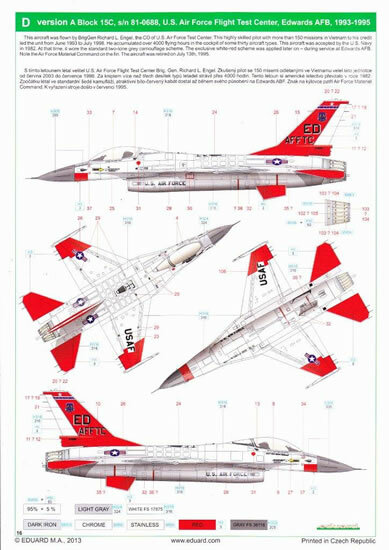 With regards to the fin there is one incorrect drawing in the fin construction, showing an extended brake chute housing however, the part numbers are correct. 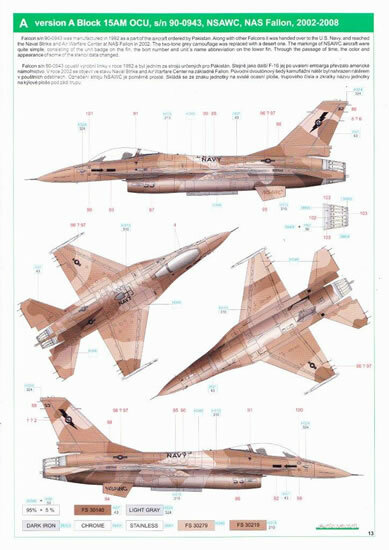 You are still supplied with all the weapon sprues, which while nice, when you look at either the NSAWC or Air Force Flight Test Centre (AFFTC) aircraft they rarely carry weapons and in fact the NSAWC birds are more often seen with an ACMI pod on one wingtip. 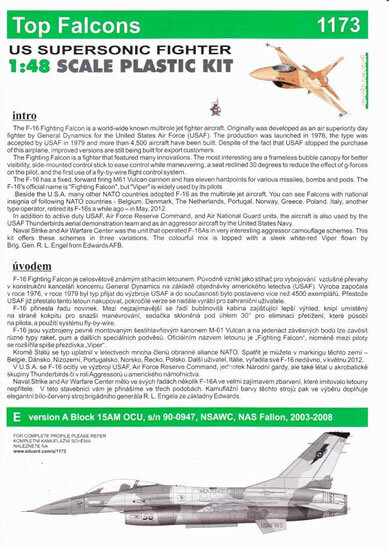 The NSAWC Kinetic kit actually came with an Air Combat Manoeuvring Instrumentation (ACMI) pod, this would have been a nice inclusion. Due to the multi tone camouflage patterns you will need to be careful to accurately match the patterns to the multi toned decals in places. The decals are beautifully produced by Cartograf of Italy. It is nice to see the inclusion of a brightly coloured AFFTC bird. While the instructions calls for Gunze H3 (red), this is a colour that will cause no end of discussion. Red or orange? That is the question here. I can find images to support both colours however, I do know that flight test aircraft modifications including wiring, etc. are always orange. So if I were to paint the AFFTC bird I would start with orange and add a hint of red. I have not seen these aircraft up close. You choose! 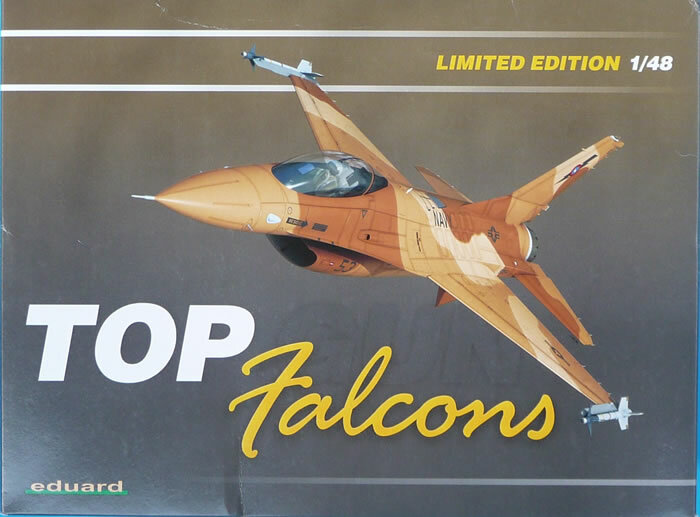 What a great release we have here, if you are interested in either the NSAWC or AFFTC jet, like to add resin improvements to your build, like the look that Photo Etch brings to a cockpit and are after value for your modelling dollar, then this Top Falcon release from Eduard is for you. But get in quick as there are only 1500 kits.